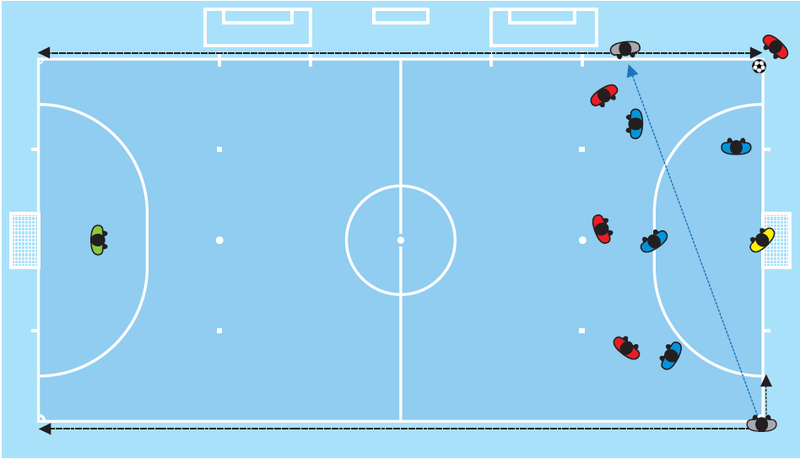 Futsal referee positioning is quite hard to get used to at first. The diagrams on this page are in no way claimed to be my own. They are screencaps of FIFA’s Futsal Laws of the Game and all credit is due to them for it. 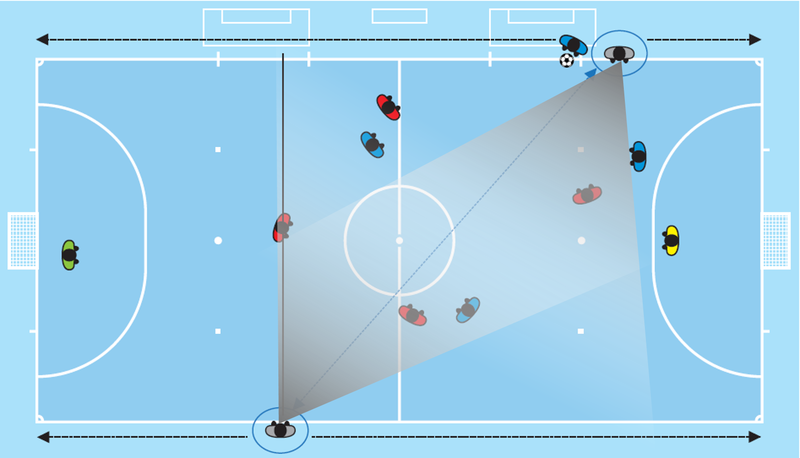 FIFA Futsal’s positioning system works on a simple principle. 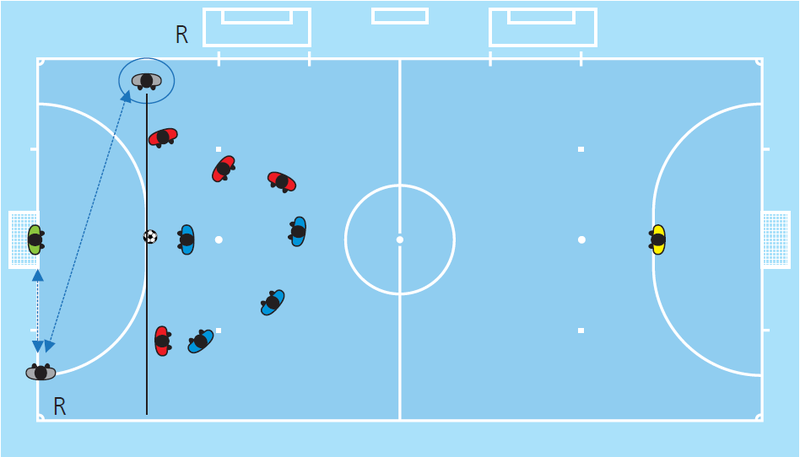 The referee form a diagonal with both generally positioned with the second last defender of both teams. Not for the purpose of offside but rather to keep the referee team’s court coverage on play and majority of players. Have a quick glance at this diagram below. You can see the typical set-up for a kick-in. Notice that each referee is near the second last defender of either team while maintaining visual eye contact between each other. We now revisit the same scenario and I have represented the court coverage of both referees on the diagram below and we can see that a great deal of play is covered. Note that the court coverage is much stronger than it would be for football. This is because there is far less area to cover and distance to watch so their envisioned areas depicted below is quite secure and in fact, thicker. Essentially only the goalkeepers are omitted from the vision of the referees. Some variance by looking around can have all bases of the court covered. So you see that eye contact is built into the referee system of Futsal. I think it can’t be emphasised as much until you try your first game with an experienced official. Without flicking your eyes up at your partner referee during the game EVERY 7 seconds, someone will probably end up in the wrong position. Eye contact is essential to teamwork because when play restarts quickly after going out of play, sometimes the ball is quickly put back into play only giving time for the referee crew to glance at each other. With some good teamwork, maintaining the current position which is wrong can be right if they work together to maintain the diagonal. Quick thinking for the players with 4 seconds but no doubt requires quickness from referees as well. A great way to learn and improve your concentration levels for football refereeing as well. What is a page/post about referee positioning without covering each restart of play. My aim is to cover information and observations that are deemed intuitive in the Laws and not explicitly mentioned for the most part. We start with who gets what side. Referee 1, the senior official, goes on the bench side. Referee 2 will be on the opposite end. The start of play is, of course, the kick-off and works as follows. You will notice that R1 represents Referee 1 and R2, Referee 2. Despite this being FIFA’s guideline, the way that the pre-game instructions I have with my partner usually involves that the person noting goals assumes the position of Referee 1 as it typically involves less walking for them and allows a quicker restart of play. 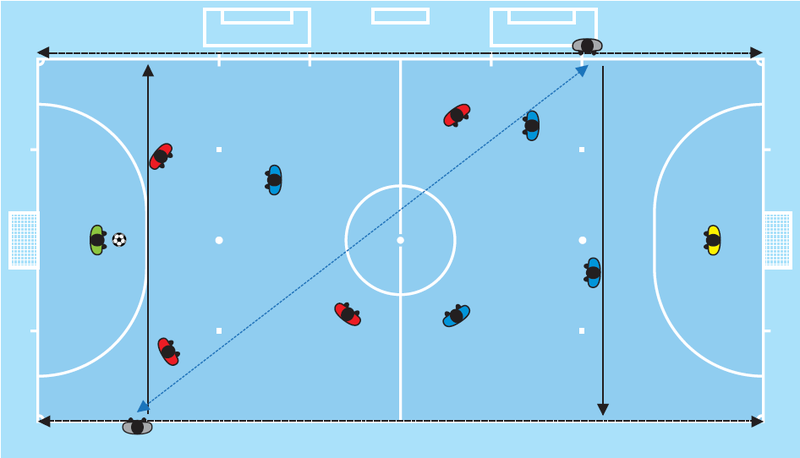 Otherwise typically the referee closest to where the goal is scored assumes the position at the halfway line to minimise the movement of both referees. I’m sure the goal of FIFA’s image above is to allow Referee 1 to inform the Third Official and Timekeeper of the goal scorer and other details. 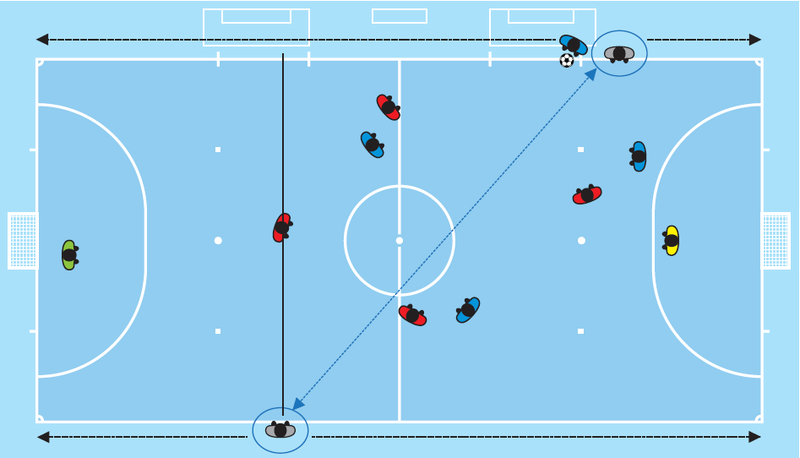 The simplest way of understanding this diagonal system is that the referees will move back-and-forth with the second last defender during play. The only restarts that require the referees to do what I call a “switch-over” are kick-ins and corner kicks. Keep that in mind. 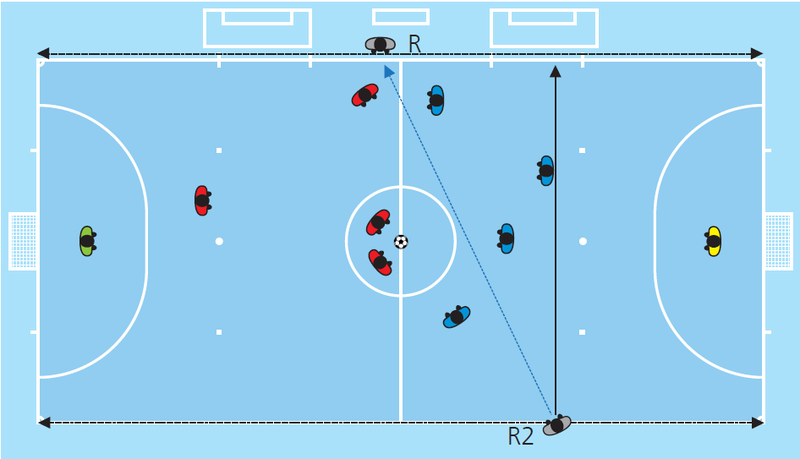 Very important as the majority of sprints in Futsal are caused by these restarts. 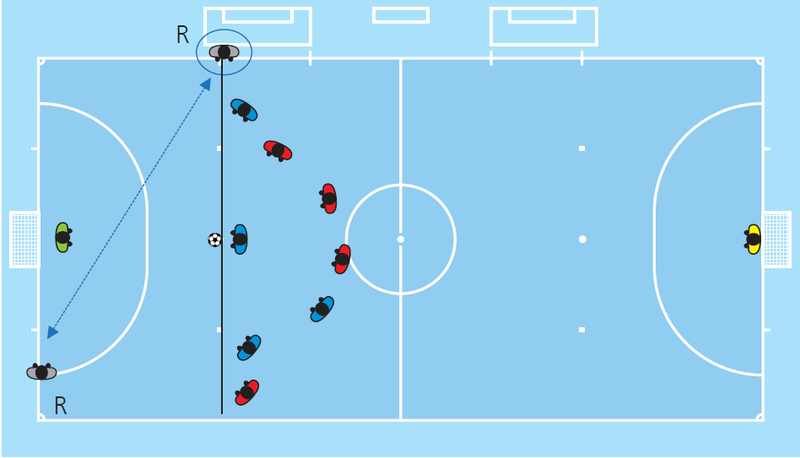 A switch-over is when both referees need to adjust position due to a restart of play; mostly for kick-ins. The diagonal changes. For example with the diagram above, Referee 2 needs to move over horizontally to across the court of where Referee 1 is and vice versa so that instead of a negative gradient diagonal, it becomes a positive gradient (the mathie side in me). Now this may not seem like a big deal when you look at the diagram above but imagine when play is stretched on a FIFA size Futsal court and the player restarting play grabs the ball and quickly prepares to restart. The split-second decision making for positioning becomes crucial to get the optimum view position (OVP) as my mentor JE loves saying! Here are the two guideline positions for kick-ins. 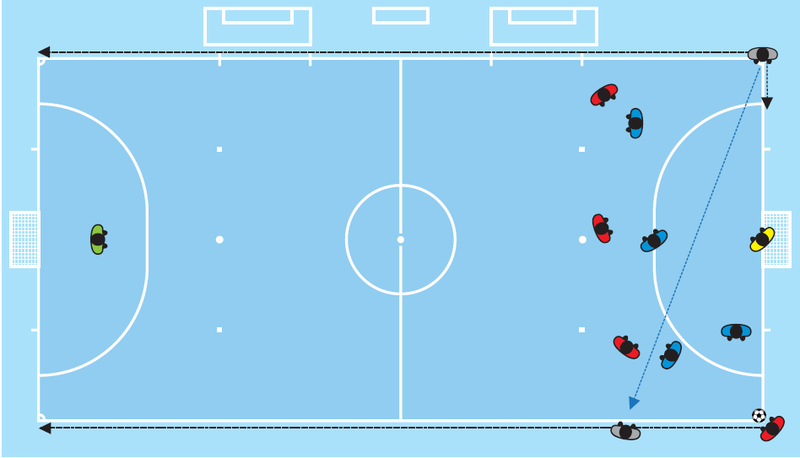 Notice that the closest referee is behind the kicker and that the referee on the far-side/bottom is with the second last defender on the other half of the court. The next diagram is another occurrence of a kick-in. With attacking kick-ins near the opposing goal, the referees assume a similar position to a corner kick where the referee on the near touchline deflects away from the corner. This has to be the simplest guideline. Nearest referee counts and is positioned at the top of the penalty area to watch for the arm reaching over the penalty area line. Furthest referee with the second last defender at the opposite end and there is great court coverage during the game. For corner kicks, the nearest referee moves away from the kicker to the top of the PA (usually for basketball-line games) or slightly further to keep court coverage and eye contact with his partner while counting. 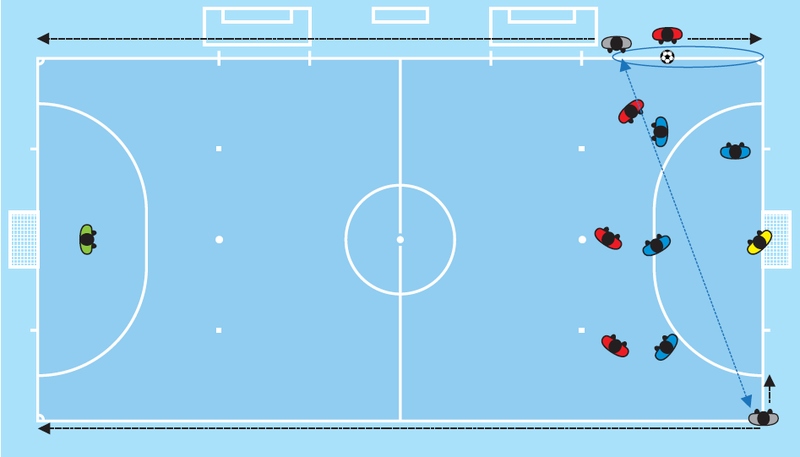 The opposite referee is positioned on the goal line to watch if the ball crosses the line as demonstrated below in both scenarios. One referee in line with the ball and the other with the goal line. Similar to penalty kicks only that the ball is positioned slightly further back. Despite all this advice on positioning, teamwork trumps all as with eye contact and a good team. If you and your partner cannot adjust to the appropriate position, eye contact and a quick decision to retain the current positions can help maintain a good view on play and ensure that both referees have two good angles to take the correct decisions. Futsal. Small but yet quite complicated as football.